The antibacterial triclosan has been around for years but has suddenly burst onto the scene as Public Enemy No. 1. It stands accused of promoting the growth of antibiotic resistant bacteria and needlessly raising consumers' cancer risk. The latest national brand to be tarred with the triclosan brush is Colgate Total toothpaste, which contains the chemical that's also found in numerous soaps and cosmetics, where it acts as an antibacterial agent. The National Resources Defense Council (NRDC) recommends that consumers avoid anything containing triclosan, saying it can "disrupt hormones and can encourage the growth of drug-resistant bacteria or 'superbugs.'" A D.C.-based consumer group, Safer Chemicals, Healthy Families, is organizing local activists to persuade stores to remove products containing triclosan. Colgate has defended the chemical's use in toothpaste, noting it went through a rigorous Food and Drug Administration (FDA) approval process before being approved as an over-the-counter drug in 1997. "Colgate Total toothpaste is uniquely formulated with 0.3% of the antibacterial ingredient triclosan to fight harmful plaque germs, which are the cause of most common oral health problems," Colgate said in a statement on its website. "Colgate Total is clinically proven to work better than other toothpastes in reducing the germs that can cause gum disease." 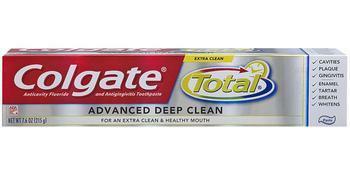 The company said Colgate Total is the only toothpaste on the market that has undergone the U.S. Food and Drug Administration's New Drug Application (NDA) review process for efficacy and safety. "There are more published, peer-reviewed clinical studies of Colgate Total than of any other toothpaste in the world," Colgate said, adding that the "safety and efficacy of Colgate Total toothpaste is supported by more than 90 scientific studies, involving 20,000 people, as well as by a broad set of safety evaluations." “We think that it’s critically important for retailers and for brands like Colgate to move swiftly in phasing out this unnecessary hazardous chemical once and for all,” Schade said in an interview published by Bloomberg News. Brands that don't use triclosan are losing no time publicizing that fact. Crest toothpastes "are 100% TRICLOSAN FREE," Crest said on its website aimed at dental professionals. "The active ingredient in Crest Pro-Health toothpastes is stannous fluoride. The stabilized form of stannous fluoride found in Crest Pro-Health is clinically proven to protect against gingivitis, plaque, tooth sensitivity and bad breath, while still providing the trusted cavity protection you expect from Crest." While Crest may be seen as taking advantage of a competitor's misfortune, consumer and public-interest groups say they are looking out for the long-term health interest of all Americans. The NRDC notes that surveys of the U.S. population from ages 6 to over 65 have found residues of triclosan in over three-quarters of people. "Though triclosan has been measured in house dust, most people are likely to be exposed by applying products that contain triclosan to their skin," the organization said. "One study of nursing mothers found higher levels of triclosan in blood and breast milk of women who used personal care products containing triclosan." Avoid anything labeled "antibacterial" or "antimicrobial" which contains triclosan or triclocarban, such as soaps, gels, cleansers, toothpaste, cosmetics and other personal care products. Avoid other "antibacterial" or "antimicrobial" items such as cutting boards, towels, yoga mats, shoes, clothing and bedding. Use regular soap and hot water to clean effectively. Use alcohol-based hand sanitizers when you don’t have access to running water.